Are Japan¡¯s ubiquitous personal seals endangered? DUST SETTLES over the shelves in Fujio Kawasaki¡¯s shop. 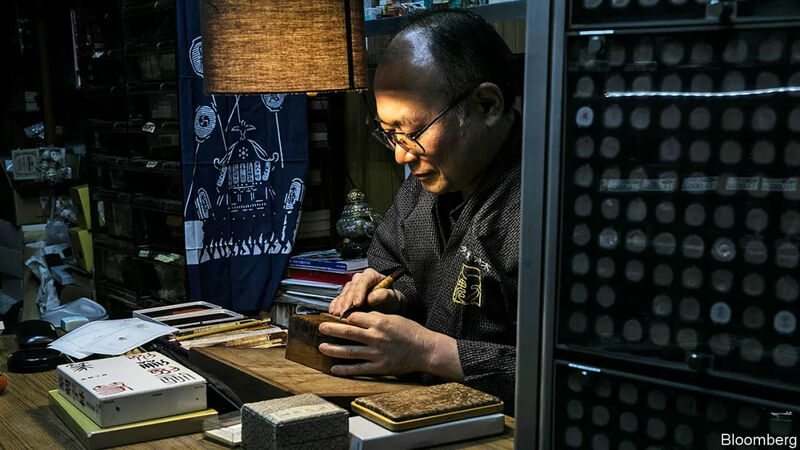 Customers once sought out this corner of Tokyo for quality hanko, the personal seals Japanese use as signatures. Among the goods on display is a seal carved from elephant tusk, a relic from a bygone era. Nobody will fork out £¤80,000 ($720) for such items these days, says Mr Kawasaki. Now he fears the government will force him out of business altogether. Hanko are a feature of life in Japan. Every adult¡ªeven the emperor¡ªhas one. They are required to buy a car, rent an apartment or get married. Managers use them to sign off on the endless faxes, memos and other antiquated documents that continue to circulate in offices. All this paperwork makes Japanese offices among the least efficient in the rich world. Dogged by low productivity and hence poor profitability, Japan¡¯s three biggest banks have begun allowing customers to open accounts without hanko. Most Japanese will soon be pressing fingers to screens instead of wood to paper, predicts Noriaki Maruyama, president of an online bank. Local governments are starting to process transactions electronically, too. The Digital First Bill, currently zipping through parliament, seeks to do away with yet more forms and stamps. The rationale for the legislation is simple and sound, argues Takuya Hirai, minister of science and technology. Japanese people waste far too much time filling in forms, he says; the shrinking population can no longer afford to maintain this bloated paper-based bureaucracy. Mr Hirai has little sympathy for the sentimental national attachment to personal seals. The hanko industry has reacted with an emotional letter, pleading with Mr Hirai to scrap his plans. The bill threatens the livelihood of over 10,000 seal shops like Mr Kawasaki¡¯s, it argues. Hanko are far superior to ¡°Western-style signatures¡±, the letter says, because bosses can save time by entrusting their seals to proxies, who can then approve documents on their behalf. ¡°We are proud of how this system contributed to Japan¡¯s post-war economic growth,¡± it concludes. Mr Kawasaki thinks the government¡¯s effort to diminish paperwork is a plot to do away with the sort of paper-trails that have been used to hold it to account in several recent scandals. Many Japanese seem ready to let go, however. The use of signatures had been spreading even before the government got involved. Mr Kawasaki¡¯s shop is more than 80 years old. His father founded it. But it will not survive to the next generation, Mr Kawasaki laments.